While my own personal sled measures 550cc in overall displacement and can only reach speeds in the triple digits if it’s on a trailer being towed by a 707-horsepower Jeep Grand Cherokee Trackhawk, this writer still enjoys a quick, fast and superb handling sled. For me, that sled has to be the 2018 Yamaha Sidewinder L-TX LE 50th anniversary edition. Next year it will be something else. And I’ll still have my 550cc fan-cooled scooter to entertain me. When trying to envision which of the new 2018 sleds we’d want most, we checked off a very short list of must haves. It needed power, preferably more than any other brand and model in 2018. It needed to be trail friendly and offer amenities suitable for a veteran rider long past his racing shelf life. Handling needed to be crisp and consistent with easy to adjust suspension settings for the competent but inherently lazy rider who chooses not to fiddle with air pumps, atmosphere and temperature readings. And the track length needed to be short-ish, not of the deep powder kind, but long enough to handle high horsepower that could spin the track at an inopportune moment – like exiting a tight, icy corner. 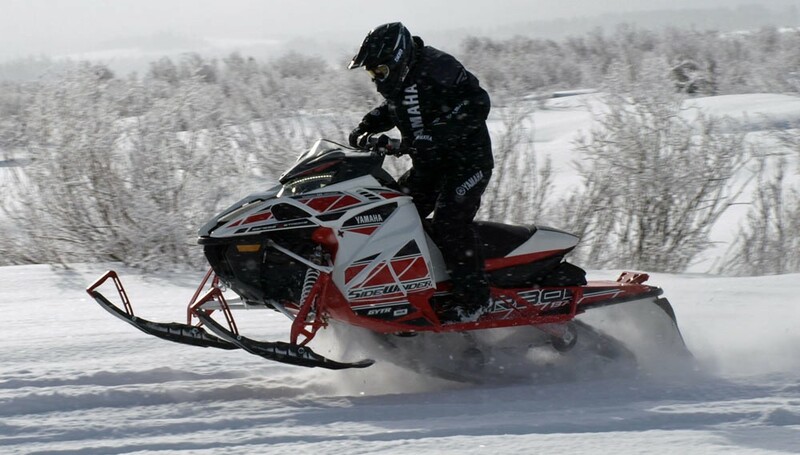 The sled we prefer must be high performance-oriented, but suitable for a rider whose racer-quick reflexes have ebbed. Those checkmarks brought us to a turbocharged sled, the most powerful for 2018. That left us choosing between one of the Yamaha and Arctic Cat partnerships groomed trail offerings. We considered the Thundercat and Sidewinder R-TX, both powered by Yamaha’s Genesis 998cc three-cylinder turbo. But the base 129-inch track length seemed too short for us to catch the 200-plus horses the 998cc turbo puts to the snow. We wanted the added length of the 137-inch track, for comfort’s sake and our piece of mind. Yamaha celebrates its 50th season in snowmobiling with this smartly packaged Sidewinder L-TX LE graphics package. Here we found the decision easier. We put the Thundercat on the sidelines as well as the 50th anniversary edition of Yamaha’s Sidewinder R-TX LE with the 129-inch Ripsaw 2 track. There were things we liked about the R-TX, but after a bit of refection and a check of the spec sheets, we realized that Yamaha’s Sidewinder L-TX LE 50th model was exactly what we had in mind. We prefer the added length of the L-TX 137-inch track to handle the Sidewinder’s 200 horses and smooth out niggling trail bumps. The key difference between the R-TX and the L-TX is the track. Virtually everything else is quite similar. Power from this 998cc turbo is unmatched by anything currently offered, though we have difficulty seeing Ski-Doo sitting idly by on the sidelines without a most powerful turbo of their own. Just saying. Handling and ride, thanks to Cat’s chassis and suspension expertise, is as good as any other brand. Then there are the onboard ergonomics, which are very good as well. Yamaha shares its 200-plus horsepower Genesis 998cc turbo with Arctic Cat, which shoehorn’s it into Cat’s Next Gen body work and Yamaha’s Sidewinder shell. Availability for the Yamaha Sidewinder L-TX LE 50th anniversary edition expired in late Spring, leaving you a choice of the blue and white non-50th anniversary trimmed and less expensive Sidewinder L-TX SE. But since this is a fantasy, our choice is the LE in red and white 50th anniversary trim. It stands out on the trail, in the garage and as something special. At nearly US$17,000, the 50th anniversary is not cheap and is priced US$1300 more than the “base” in-season blue version SE. If you missed Yamaha’s Spring Power Surge timeline and didn’t get dibs on the 50th Anniversary Edition, don’t fret. The in-season SE offers nearly the same components package, sort of. You won’t get the Fox 1.5 Zero QS3 shocks with the slick Kashima coating on the front and rear suspensions. Nor will you get the two-stage heated seat, though it’s an option. Although renamed SRV, the Sidewinder front suspension comes from Arctic Cat but is fitted with top of the line Fox QS3 quick-adjust shocks with Kashima coating. Yamaha’s Tuner III ski adds consistency for cornering bite. The standard heated seat with its dual high and low settings adds to on-trail comfortability and is one of those things you’d get again once you have it. The ergonomics of the Sidewinder and its manufacturing attention to detail may not be quite up to the standards seen and expected in a “heritage” Yamaha product like the Apex. They still are quite good, showing Yamaha’s influence and demand for attention to detail on Arctic Cat’s Thief River Falls assembly line. Equipped with the Camso 137-inch Ripsaw track with 1.25-inch lug profile, the Sidewinder L-TX LE shreds backcountry snow with ease. In our fantasy world of the right sled for us, the Sidewinder L-TX LE makes us very happy. Amongst production sleds, only a turbo Cat can run with the Sidewinder. Last year Yamaha coyly claimed 180-ish horsepower for its turbo 998. Cat suggested at least 200 horsepower and didn’t correct anyone hinting at 220! Let’s just say that the Sidewinder’s power output lives somewhere north of 180 and south of 220. What else comes close? Certainly nothing in the normally aspirated world of 800s and 850s. The Sidewinder’s power delivery comes as you’d expect from a modern Yamaha-engineered product. It is incredibly mystifying with smoothness that belies all but the gauge’s digital readout. The power hooks up smoothly from power takeoff through Yamaha’s own high performance YSRC clutching of primary and roller secondary clutches. They are specifically designed for durable, cool operation to transfer the turbo’s low end torque efficiently to the track while minimizing drive belt wear. You’ll feel the roller secondary quickly back shifting and using its oversize sheaves to add an overdrive “feel” when accelerating to top end. This high horsepower sled relies on its hood and side scoops to keep underhood temperatures under control. Although you know this sled has power and can feel it when applying full throttle, the Sidewinder L-TX will let you let you dawdle along. This powerful sled suits many styles of riding. It’s one of the features we like best about it. Yamaha’s joint operation with Arctic Cat boosted Yamaha sales. Rumor has it that the Sidewinder’s popularity caught Yamaha a little by surprise as the turbos took away some expected Viper sales. All things being equal and in the case of the Sidewinder versus the 120-ish horsepower Viper, they are not! Feature-wise, ergonomics-wise, weight-wise the Viper and Sidewinder share well. But adding 80 to 100 more horsepower to a Viper L-TX LE 50TH Anniversary Edition allows Yamaha to boost the price up to US$2500 more. And you get quite a terrific sled. It’s fast, quick, quiet and endowed with Yamaha quality and backing. It certainly ticks off all of our “must have” boxes for favorite 2018 ride. Cute and low, the racy windscreen won’t do much for you on serious sub-zero days. We’d add a taller windshield. Note the nearly perfect curved handlebar on the Sidewinder. If we had an actual one, we’d mess it up a bit by adding a taller windscreen and some serious trail bags that carry more than a drive belt and maybe a bottle of water. That would be about all we’d do. The 2018 Yamaha Sidewinder L-TX LE 50th Anniversary edition says a great deal about Yamaha’s 50 years in the snowmobile business. It’s all good!